Edinburgh Castle is a historic fortress dominating the skyline of Scotland’s capital city, Edinburgh, Scotland. There has been a royal castle here since at least the reign of David I in the 12th century, and the site continued to be a royal residence until 1633. Edinburgh Castle was involved in many historical conflicts from the Wars of Scottish Independence in the 14th century to the Jacobite rising of 1745. Research undertaken in 2014 identified 26 sieges in its 1100-year-old history, giving it a claim to having been “the most besieged place in Great Britain and one of the most attacked in the world”. Edinburgh Castle is the impressive site of the Royal Edinburgh Military Tattoo, a largely military showcase of the pipes and drums of the Scottish regiments and other military regiments from around the world. The tattoo attracts an annual audience of 217,000 and broadcasts in some 30 countries to an audience estimated at 100 million. 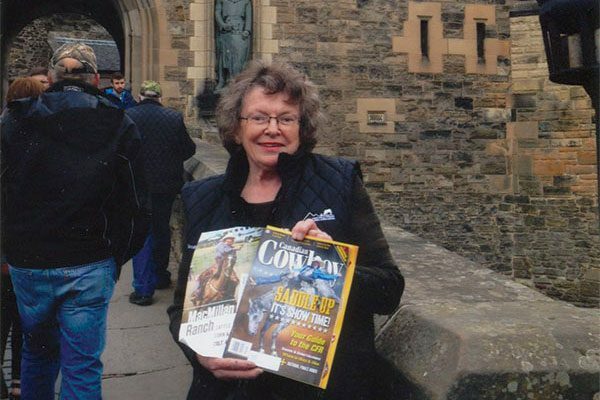 The castle, in the care of Historic Scotland, is Scotland’s most-visited paid tourist attraction, with over 2 million visitors a year, including Roberta “Bertie” Lawrence of Elk Point, Alta.